A map, hidden in the gospel of Matthew, is the key to awakening the sleeping giant in the church - men. Sounds like fiction, but it's true. The apostle Matthew embedded a map into his gospel. History's greatest men, including Christ himself, followed this map. The Map begins as a fictional tale of murder, deception, and greed as three men fight to uncover the most important discovery since the Dead Sea Scrolls. Then, using the tale as a parable, Murrow shows men what the map looks like, where it is found in the Bible, and how to walk its three ancient pathways today: Submission, Strength, Sacrifice. A map, hidden in the gospel of Matthew, is the key to awakening the sleeping giant in the church-men. Sounds like fiction, but it's true. Murrow stumbled across the map in 2006. After three years of research and writing, he is ready to reveal it to the world. A map, written in code and hidden in the gospel of Matthew, reveals a truth so explosive it could rock the foundations of Christianity?or lead to its rebirth. A cleric appears out of the rain-spattered darkness, bearing a mysterious message: A long-lost map with the power to transform men is on the verge of being discovered. Thrown headlong into a global chase, author David Murrow must race to find the map before it falls into the wrong hands and disappears forever. 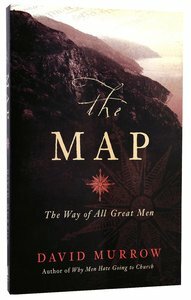 The Map, which begins as an action thriller and then transitions into a modern-day parable, reveals the path every great man ? including Christ himself ? has walked. In this dynamic follow-up to the best-selling Why Men Hate Going to Church, Murrow cleverly translates the masculine spiritual life into an actual, ink-on-paper map. Then he shows men where to find the map in the New Testament and how to walk its ancient paths today.